At the Bangkok residents, who are already suffering from a collapsed on them, the elements, strikes fear and even tens of crocodiles roaming freely in the capital. Reptiles escaped from farms during floods. This is mainly young ones, no longer than a meter. Crocodiles have been able to climb over the fence flooded farm. Many crawled out on the highway, where they were hit by a car, transfers MTRK "Peace . " To capture the fugitives went hungry toothy special teams. They catch them alive and delivered back to the farm. Thus, 8 large reptiles were found on the border of Bangkok and the provinces of Pathum Thani, on the streets of one of the flooded villages. Two more had to shoot because they were aggressive. And for each returned crocodile mountain farmers to pay 20-30 dollars. Read: Crocodiles-fugitives alarmed Thailand . Recall that in Bangkok over the weekend was dominated by the powerful flood. The capital was declared a disaster. As reported in "Pravda.Ru" previously crocodiles, also taking advantage of what is happening in the country, ran a farm in the province Uthay Thani in the center of the country. Raised in captivity, animals have no idea how to earn their own food, not to mention the fact that absolutely can not attack the person. 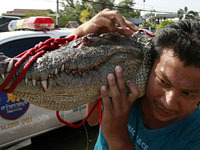 In mid-September mass "escape" reptiles occurred on a farm near the tourist resort of Pattaya, like Comments.UA . All fled when predators have now been captured or found dead. However, these shoots with crocodile farms occur each year in the rainy season. But this year, Thailand suffered a catastrophic flood season, which lasts for more than two months. Read the most interesting in the section "Interesting News"